During the summer I buy most of my produce at Chicago’s Green City Market—a fantastic farmer’s market that connects local producers and farmers to chefs, restaurateurs, food organizations, and the public. I love cooking with locally sourced ingredients and find that using seasonal, high-quality blueberries and tomatoes can turn a dish from dull to irresistible. If seasonal ingredients tremendously improve the quality of food why can’t they do the same for alcohol? In Edible Cocktails:From Garden to Glass—Seasonal Cocktails with a Fresh Twist, Natalie Bovis proves they can. Natalie gives you tips, tricks, and recipes for making extraordinary cocktails with delicious, fresh foods. Her recipes range from simple to complex, classic to unique, and include jams and syrups in addition to alcoholic beverages. Immediately upon reading the book, I dogeared every other page; recipes on my short-list include: a Ginger Berry Flip, Fig and Whiskey Preserves, Smoked Bacon-Washed Bourbon, and a Cilantro-Cucumber Vodka Collins. 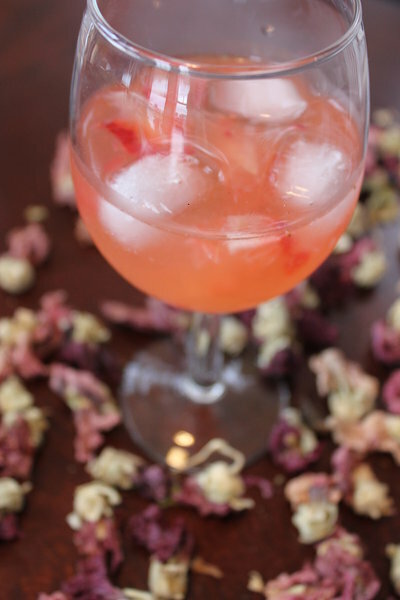 Last weekend, for a friend’s birthday party, I checked one cocktail off my list: the Garden Bloom—a wine-based cocktail that begins with Sauvignon Blanc and adds garden-fresh ingredients including strawberries and lavender-rosemary syrup. My friends called the drink “liquid candy” and could not get enough of it. I eventually had to cut everyone off when I ran out of lemon juice, but by then it was becoming evident that we all indulged in a few too many Garden Blooms (recipe below). Leave a comment below and tell us about your most imaginative cocktail flavor! 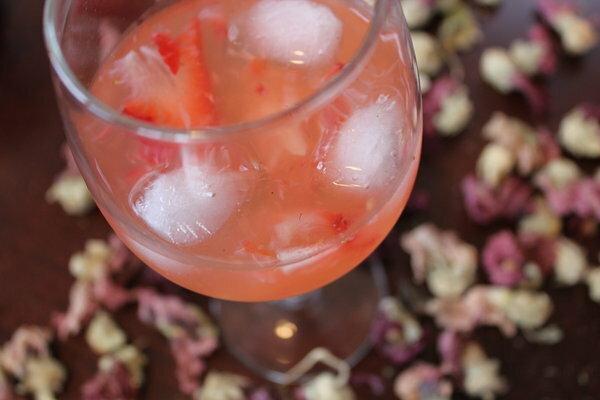 Muddle strawberry with lemon juice. Add Lavender-Rosemary Syrup, Sauvignon Blanc, and vodka. Shake with dry ice. Double strain into an ice-filled white wine glass. Float edible flower on the surface of the drink. Bring all of the above to a boil in a saucepan, stirring occasionally. Reduce heat to low. Simmer on low for 10 minutes. Let cool. Double strain into a glass jar or bottle. Refrigerate. This looks delicious! I would love to try something with basil or rhubarb. I subscribe to the SKC newsletter. I’d love to try a cocktail with freshly-picked blackberries. Besides Margaritas, a drink made with Midori and pineapple juice & a bit of honeydew melon always reminds me of summer. They might already have these, but I think a cotton candy cocktail would be fun and delicious! I am thinking a blackberry lime concoction sounds fabulous! I am a subscriber to the SKC newsletter. I’d like a pear kiwi drink – fruity, but nice for a summer evening.